Lush Fab Glam Inspired Lifestyle For The Modern Woman: Fall Fashion Obsession: Nicole Ritchie's 'House of Harlow' Handbags! Fall Fashion Obsession: Nicole Ritchie's 'House of Harlow' Handbags! ﻿Fall Fashion Obsession: Nicole Ritchie's 'House of Harlow' Handbags! Nicole Ritchie just gave us one more reason to look forward to Fall fashion. Her brand 'House of Harlow' will be launching their first handbag collection this fall. Aside from the clutch bags featured below the 70's inspired 'House of Harlow' handbags will also include vintage leather, calf hair, fringe, toggles, studs and crystallized jaguar head hardware bags. The collection is priced from $150 to $650 and will be available in mid-July. Take a look at the clutch bags from Nicole Ritchie's new collection below. 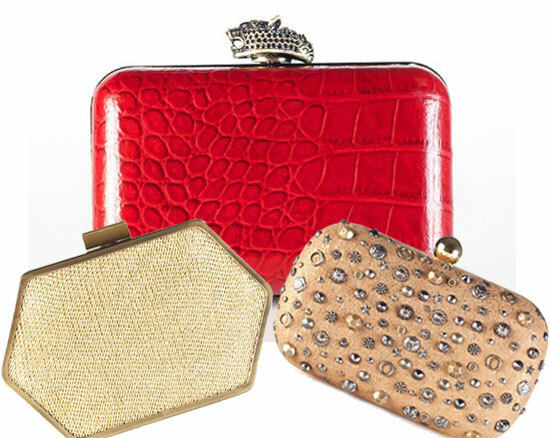 What do you think of Nicole Ritchie's 'House of Harlow' clutch bags, are they Fab or Flub? Leave a comment below. Luv luv luv the jaguar head on the red purse. I like the red and the gold stud bags. A bit pricey though for a none high-end designer. Celebrity rip off, if I'm going to pay 500 I might as well double it to get a LV or coach bag. Acquiring go through this I assumed it had been quite educational. I recognize you taking enough time and hard work to place this informative article with each other. I when once more locate myself paying strategy to a lot time the two reading through and commenting. But so what, it had been nevertheless worthwhile!